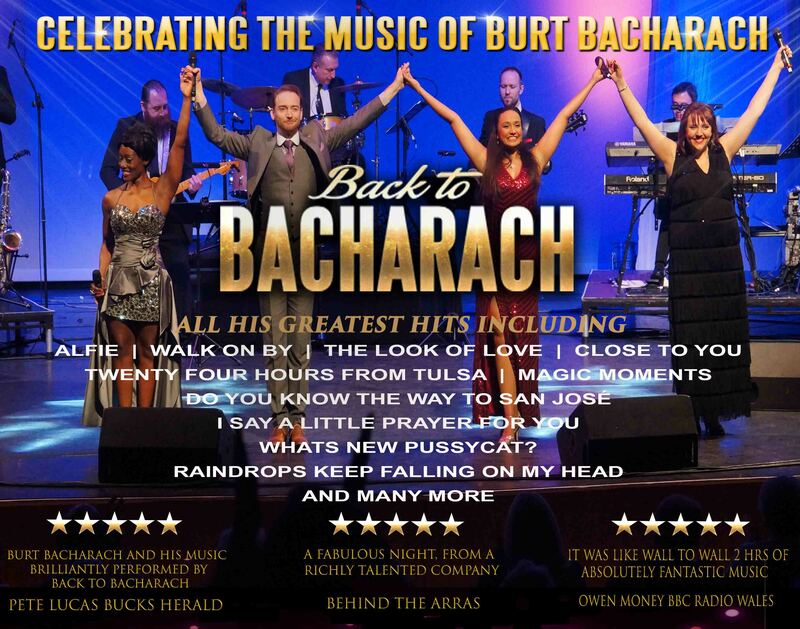 Back To Bacharach is an exciting production, touring throughout the UK featuring some of the finest West End vocalists, accompanied by the amazing "Magic Moments Orchestra", recreating Burt Bacharach's timeless masterpieces. A perfect evening of nostalgia, great songs and stunning performance. All of his greatest hits are featured in this amazing 2 hour show including... Alfie - What The World Needs Now - The Look Of Love - Close To You - I Say A Little Prayer - What's New Pussycat - Do You Know The Way To San Jose - Walk On By - Magic Moments - Trains & Boats & Planes - 24 Hrs From Tulsa - Anyone Who Had A Heart - I'll Never Fall In Love Again - Wishin' & Hopin' - Always Something There To Remind Me - Wives & Lovers - Raindrops Keep Falling On My Head & Many More Burt Bacharach is a legend of popular music who has won 6 Grammy Awards and 3 Academy awards with over 70 top 40 hits in the USA and over 50 top 40 hits in the UK, which have been recorded by many successful artists throughout the years such as: Cilla Black - Tom Jones - Dionne Warwick - Aretha Franklin - Gene Pitney - Frank Sinatra - Jack Jones - Elvis Presley - The Beatles - Dusty Springfield - Elvis Costello - The Carpenters to name a few. Back To Bacharach is a fantastic show for all ages, friends and family, songs everyone will remember and fall in love with again.